The new Stealth Tracker CCTV camera from Universal Surveillance Systems lets you install a CCTV camera in less than a minute with no cables or cords anywhere you have track lighting. Banish your old wired fixed cameras to the Stone Age. The Stealth Tracker lets you easily move it whenever you need to change or add coverage. Wrapped in a sleek and theft-deterring package, the Stealth Tracker will show you just how innovative CCTV can be. "The Stealth Tracker is an exciting new product that takes the guesswork out of installing surveillance cameras," said USS President and CEO Adel Sayegh. "This revolutionary camera is powered by the track light bar and utilizes a secure Wi-Fi network to wirelessly carry the video feed to your receiver." 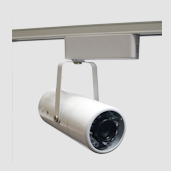 Mounting is as simple as hooking up a track light and the wireless CCTV system automatically detects and connects with the camera in less than a minute thanks to the efficient USS system programming. Come by Booth 1101 to see how the Stealth Tracker can effectively prevent theft at your store.